Of Doors, Siding and……..The Europeans!!! Welcome friends of old and those from distant lands! 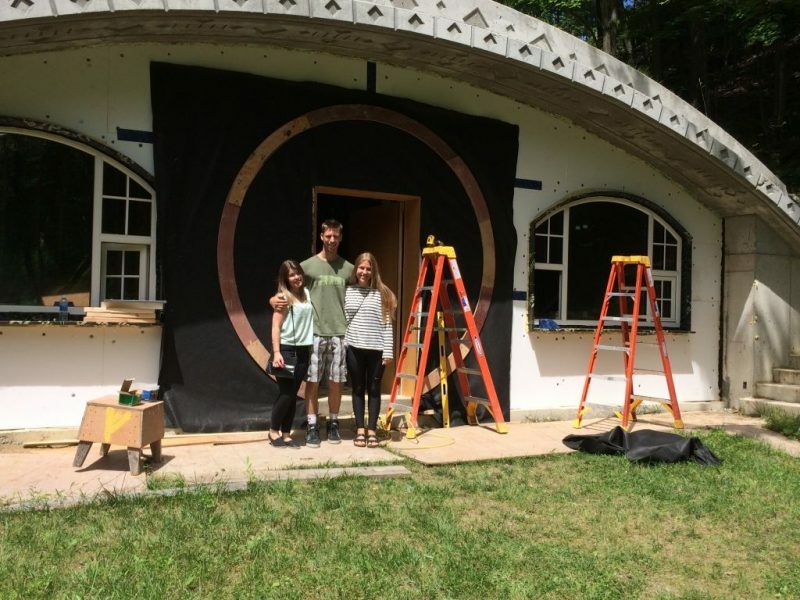 Glad to have you all back for another installment of the Hobbit Hollow Construction Blog! Getting into the technical details of the exterior now. Hmmmm. Things are a little more complicated and time consuming than I thought. And on top of that I hit a nail when I was using the router and ruined the bit I was using. Of course the local lumber store didn’t have the bit I need to finish. It figures. So we had the Europeans pay us a visit at the old homestead this past week. Scandinavians more specifically. Two of Ethan’s friends by way of his studies in Cambridge, England to be more specific. Sandra from Sweden and Mia from Denmark. What a pleasure it was meeting them and having them stay for a few days while they toured the U S of A. They got a taste of the Empire state and of Hobbit Hollow while they were here. Europeans. They’re so interesting. I gave them the tour of the Hobbit house. The house was a mess. Sorry ladies. Kind of have a lot of stuff going on over there right now and the inside has become a bit of a storage room. I think they got the gist of what it’s going to look like. Here they are with Ethan in front of the house. Sandra, Ethan, and Mia. Our Scandinavian connection. What a nice time we had with the girls. they’re heading up to check Boston out and then going to Brooklyn. Brooklyn???? Really? Good luck girls and you both get a free week at the Hobbit when I’m done. Hmmmm. That might not be for quite a while. Stay tuned! So as I was telling you last week I began the exterior trim of the front door. It’s quite involved. When you actually start putting it all together it’s really quite a lot. The devil is in the details and there is a whole bunch of stuff to consider. 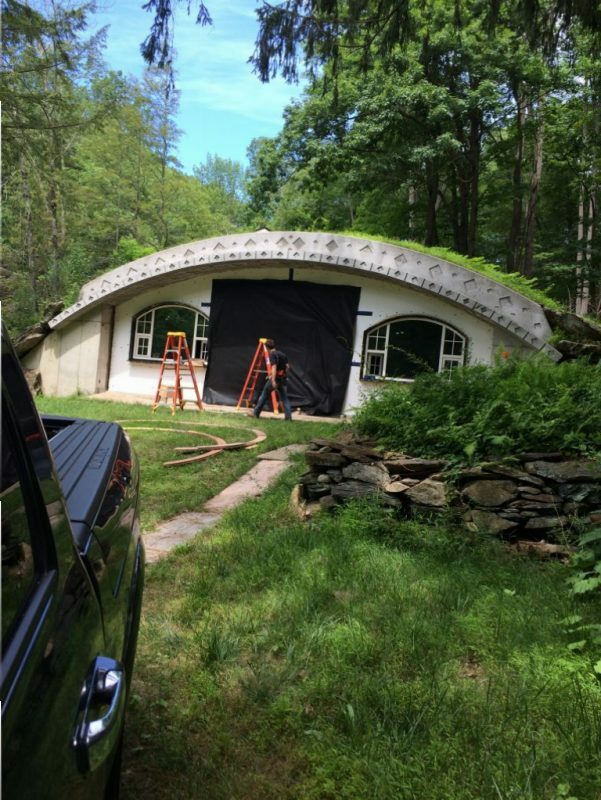 The bottom line is I have to make a circular frame to hold the door trim away from the house in order for it to clear the stone and the siding. You’ll get it once it’s all put together. I had Terence secure the first circle to the house. We’ll secure the frame to this one after we make the frame. First I have to get a new router bit. So this next picture shows you the trim with filter fabric behind it. The filter fabric is there so that moisture doesn’t get trapped between the wood and the styrofoam. We will put this on the whole outside of the house. Filter fabric goes up first. Well I have the siding coming in this week. Hopefully next week I can set Terence up with preping the North side. Gotta go. Have a great week! Lets Backup Before we Go Forward……Shall We? Thanks for writing Sandra! It was nice having you and Mia over. I’m glad you liked the house. I hope all is well with you and your family. And I’m glad you liked Brooklyn! Hey John thanks for the update! I did check out that website. Yeah, a bit different than mine but interesting nonetheless. I wish they had some more pictures of both the inside and outside. It’s encouraging to see that it really is booked up well into next year. Definitely have to find my motivation and kick it up a notch. Thanks for writing and I hope you’re enjoying the summer months! PS: I saw your message on the contact web page just so you know. I hardly ever go onto the computer. Thanks. Take it easy. Just a little blurb to say what a great time we had yesterday,it was a fun day. Good thing birthdays come once a year,imagine how old I would be,don,t go there I could just hear your comment. Well the girls where lovley we enjoyed them very much. Also missed you at Lake George. Mother-in-Law: Just got home and Terence informed me of what’s going on with the “Old Man”. There is something seriously wrong with him. I was going to come over after dinner and have a chat with him but I realized it was 6:30 and that he was probably already in bed! Looking forward to Sunday….and the ribs.